Roni-Sue’s Chocolates is the kind of chocolate shop I always wished I lived close to. Wait, on second thought, I think it’s really a blessing that I don’t. Otherwise, I’d go every single day to try a new truffle flavor and give myself the excuse of buying box after box as ‘gifts’ only to eat them myself. You should have seen me when I tried them at home…I was like an alcoholic pining for a bottle in the kitchen and constantly pacing in and out of the room trying to keep from finishing off everything all at once. This was what happened: I stopped by Essex Street Market and chanced upon the tiny gem of a sweets shop filled with dishes of adorable truffles. When I stepped into Roni-Sue’s, I was greeted with a warm smile by a woman wearing an apron behind the counter scooping what looked like chocolate ganache from a container and rolling them into mini balls. It was Rhonda-Sue, owner and chocolatier of Roni-Sue’s (short for her full name if you hadn’t figured it out yet). There was something warm and fuzzy about how the chocolate maker herself was putting together peoples’ sweets, as if there was a promise of homemade goodness. Rhonda gave me the lowdown on what was what and offered me a piece of the Truffle of the Day, which was the Dark & Stormy…a yummy dark chocolate bonbon with a big kick of fresh ginger taste followed by hints of rum and lime. Each day there’s a different truffle to sample as well as pieces of her fabulous Buttercrunch. I’ve never really had an obsession with toffee, but the Buttercrunch was the kind that practically dissolved in my mouth when crunched on and it didn’t even come close to cracking my teeth. And instead of crushed almonds, the outside was rolled in walnut bits. A mother and her young son came into the shop while I was browsing and chatting with Rhonda. As the chocolatier greeted customers, the mother turned to me and whispered: “I’m such a chocolate snob. I’ve tried so many chocolates, but I have to say these are the best in New York!” We could have continued talking chocolate, but her kid had to use the restroom. I can’t say I’ve tried every chocolate in New York, but I can say the truffles at Roni-Sue’s are fabulous. I wound up with eight chocolates upon leaving and pictured above are six…at front is the spicy Diablo, second row at left in green is Margarita, second row at right is Blueberry. Then its Portly Fig with Pumpkin Spice in the last row at left and Raspberry in the last row at right. My favorite was the Margarita, which is included in the newly debuted cocktail line, because it reminded me of a tangy key lime pie filling, but I also experienced the slight rush of alcohol as well as the salt sprinkled on the outside making it very much like…a real margarita. Next on my Must-Have-Next-Time-Again was Diablo…an exciting truffle where I could taste a spicy, sweet pepper…with real pepper flakes tossed in, yet there was no burning-my-mouth-where-I-need-milk sensation. The truffles aren’t the kind with centers that are creamy or liquid-filled…those types of ganache tend to have more cream than chocolate. Rhonda’s are heavy on the chocolate with what tastes like just enough cream to get the chocolate to absorb the additional flavors and textures. Don’t get me wrong, the ganache centers are smooth; they just wouldn’t be easily spreadable. Every taste was so simple and on the spot with each flavor, probably because it’s basically pure good chocolate combined with real ingredients and a splash of the chocolate maker’s craftsmanship. Every sweet was a balanced mix of Callebaut bittersweet chocolate and a delicious fruit, nut or alcohol - the Raspberry tasted like fresh raspberries (with a few seeds included), Frida (coffee with cinnamon) had crushed cacao nibs and Portly Fig definitely had soft, chewy, dried figs added. I wasn’t wrong on my hunch about homey goodness: the reason why these chocolates weren’t waxy (the ones that look too perfect and almost unreal) is because only fresh ingredients are used—that means no artificial flavorings, extracts or preservatives. 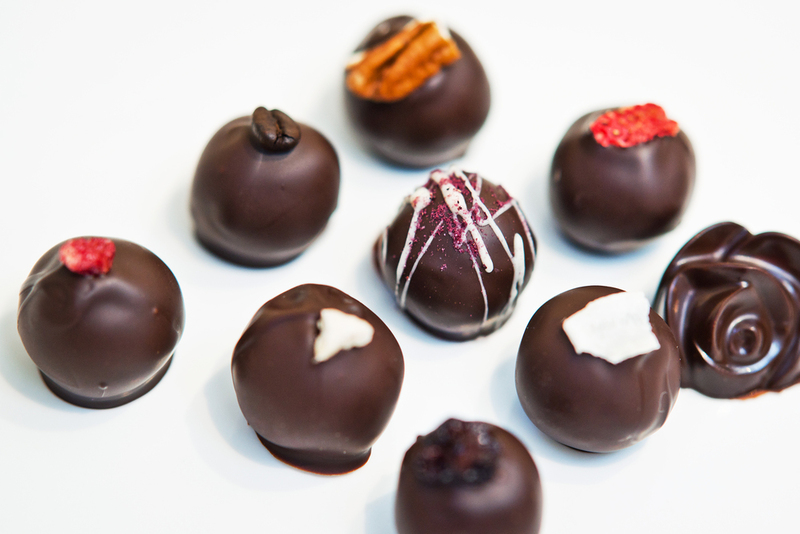 And well, nothing beats chocolates that are handmade with fine ingredients. Each truffle is $2 and a well-spent 2 bucks at that!